*Dilly Dolls*: Got yer feet covered! Back with the first of many new releases! Well, technically only one of these is brand new, but the rest have a new life! First and foremost, the shop is officially open again, and there is now a physical location inworld once again! The location is still on the Onyx Noir sim, but is in a temporary location until I can finish building the new store. There is also a small Gacha house across from the store, where I have dropped some items that I have picked up from Arcade and several other gacha events! Now onto the new releases! Many of you will recognized most of the shoes in this release. The Sonata boots are a long time fav and the most popular boot in my store. They have been given yet another new lease on life, except this time they are not rigged. I found that the rigging ruined the style of the boots overall, so they were better off left unrigged. I have also remeshed them for the second time. 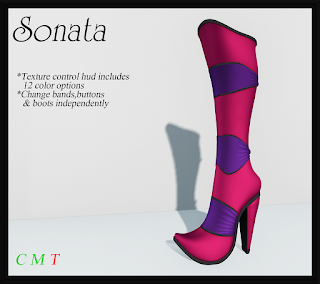 Unfortunately, I decided not to repeat the bubblegum color pack as I had done with the first re-release version. Next, since I was already working on the Sonata boots, I thought it would be fun to remake the Sonata Scrunched boots as well. There are a few differences with these ones. 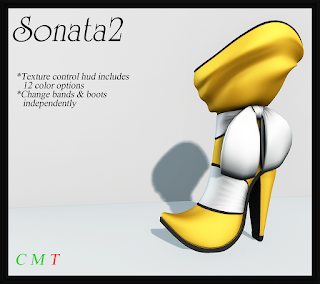 First, I have changed the name to "Sonata2" for working purposes plus, they are essentially the same as the Sonata boots only scrunched down and missing the buttons, so it made sense to just label them as a version 2 type name. Second, they are now mesh, where as they used to be sculpty. Third, the textures now match the Sonata boots instead of the plaid/knit/striped patterns that they used to have. Another set of remakes, are the Dasha pumps. 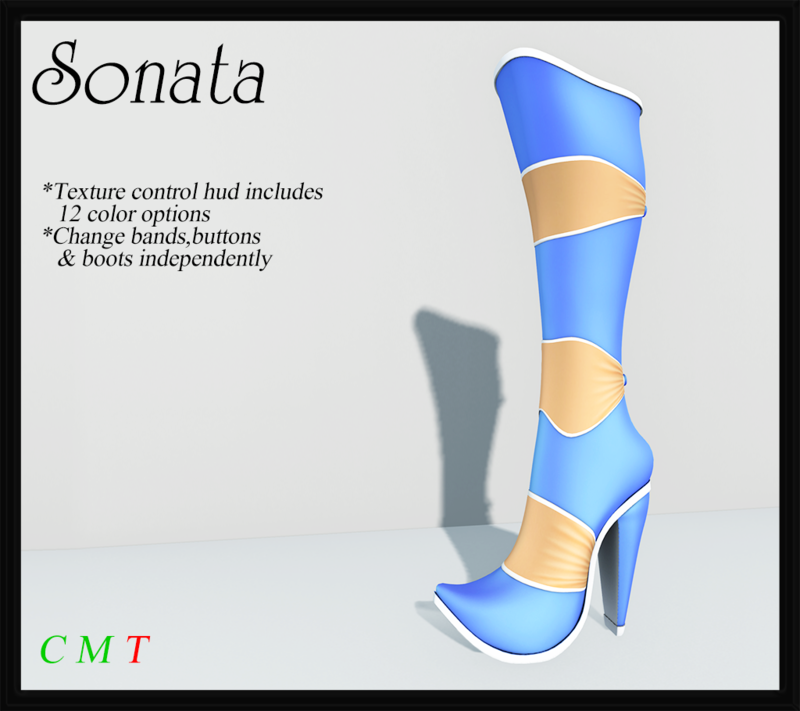 I have lowered the poly count on these, as well as made them compatible with Slink feet! Lastly, are the Adelyn pumps, which all of you have already seen a preview of. They are also rigged for the Slink feet. These shoes are available in one color pallet only, as well as a Midnight Mania exclusive color, which I have also included in the box. Just 100 clicks, and they're free!